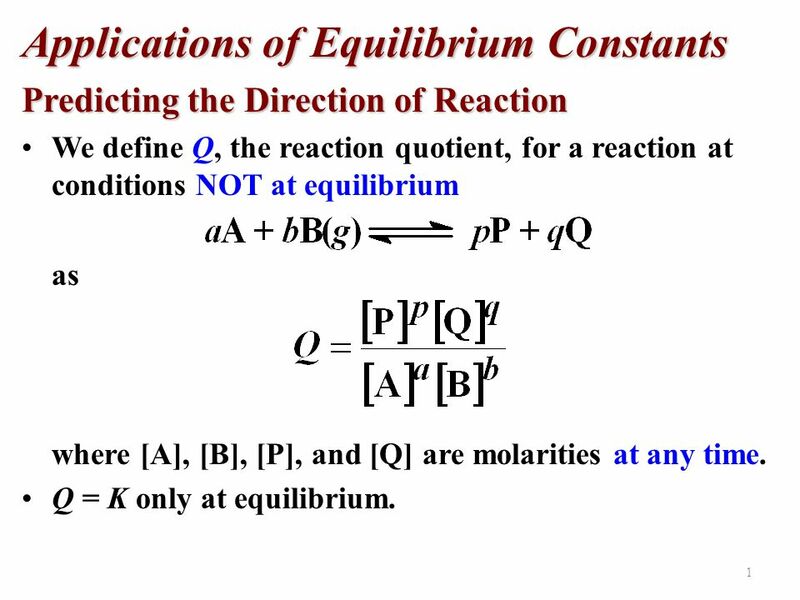 Predicting the Direction of Reaction We define Q, the reaction quotient, for a reaction at conditions NOT at equilibrium as where [A], [B], [P], and [Q] are molarities at any time. Q = K only at equilibrium. 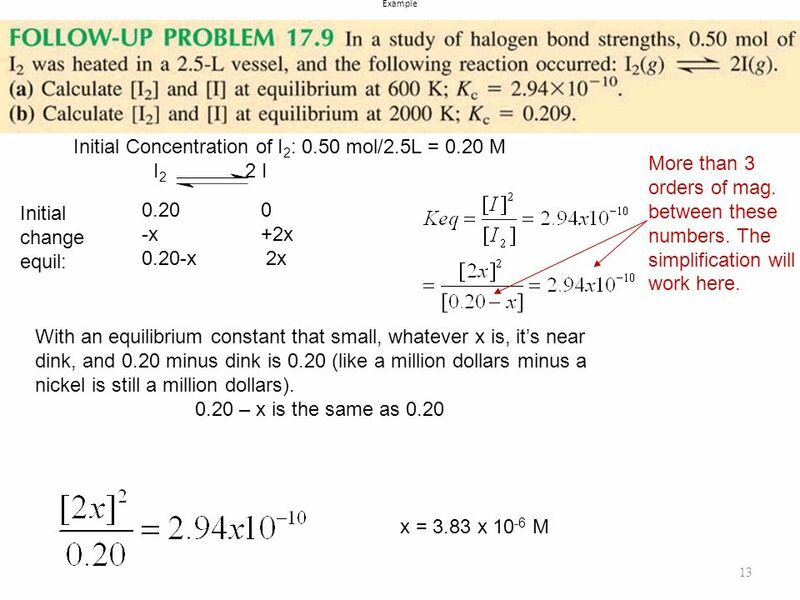 Steps to Solving Problems: Write an equilibrium expression for the balanced reaction. Write an ICE table. 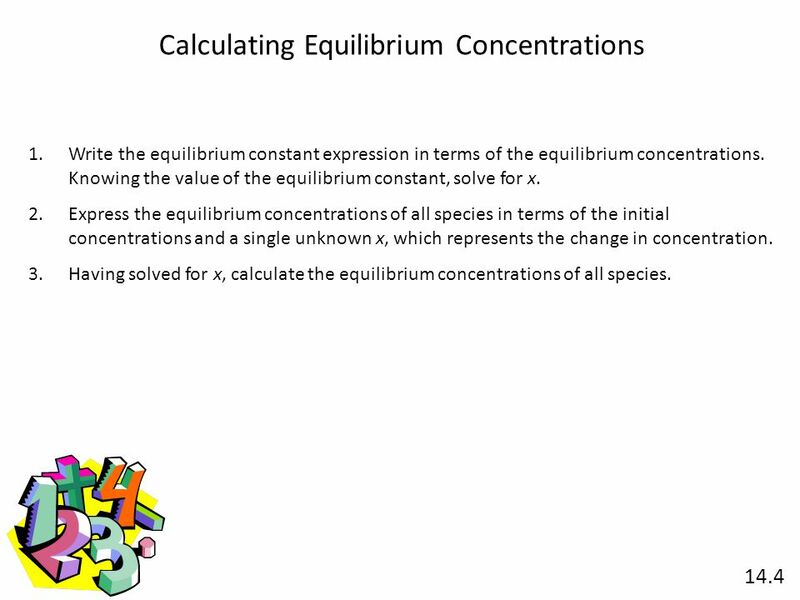 Express the equilibrium concentrations of all species in terms of the initial concentrations. Use stoichiometry (mole ratios) to express change in concentration with respect to the unknown x on the change in concentration line. 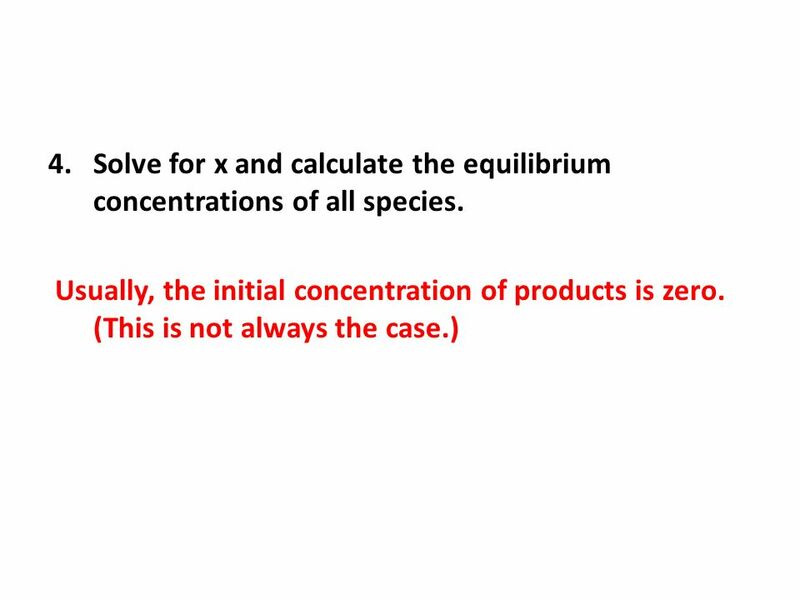 6 Solve for x and calculate the equilibrium concentrations of all species. Note the moles into a L vessel stuff ... calculate molarity. 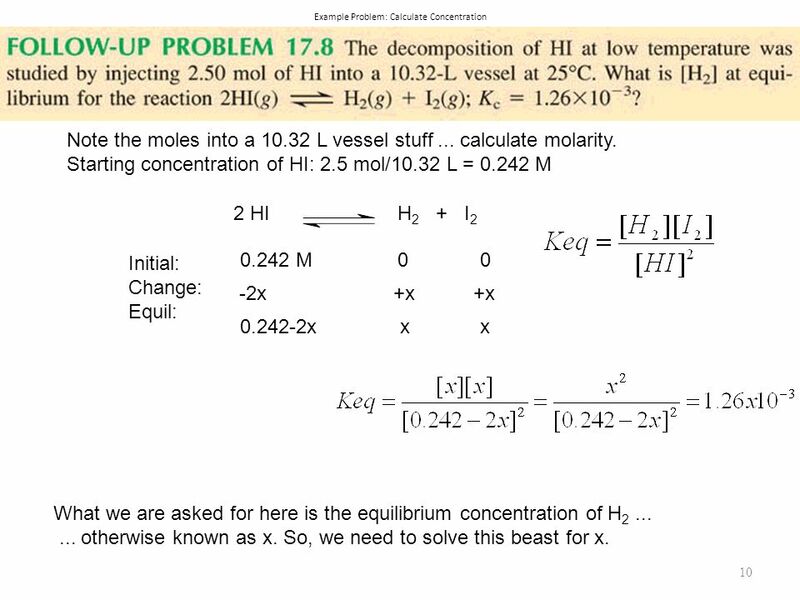 Starting concentration of HI: 2.5 mol/10.32 L = M 2 HI H I2 Initial: Change: Equil: 0.242 M -2x	+x	+x x x	x What we are asked for here is the equilibrium concentration of H2 ... ... otherwise known as x. So, we need to solve this beast for x. And yes, it’s a quadratic equation. Doing a bit of rearranging: x = or – Since we are using this to model a real, physical system, we reject the negative root. The [H2] at equil. 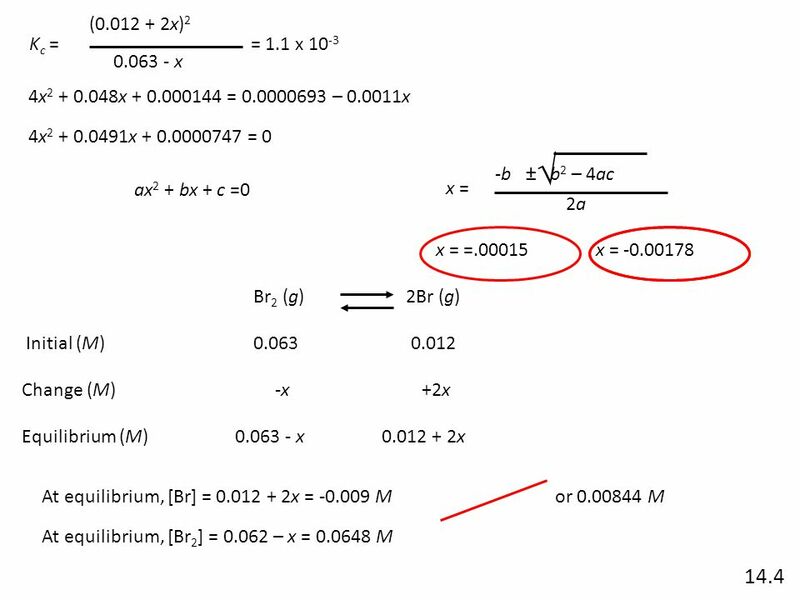 is M.
12 Approximating If Keq is really small the reaction will not proceed to the right very far, meaning the equilibrium concentrations will be nearly the same as the initial concentrations of your reactants. 0.20 – x is just about 0.20 is x is really dinky. If the difference between Keq and initial concentrations is around 3 orders of magnitude or more, go for it. Otherwise, you have to use the quadratic. Download ppt "Applications of Equilibrium Constants"
When do you use this? 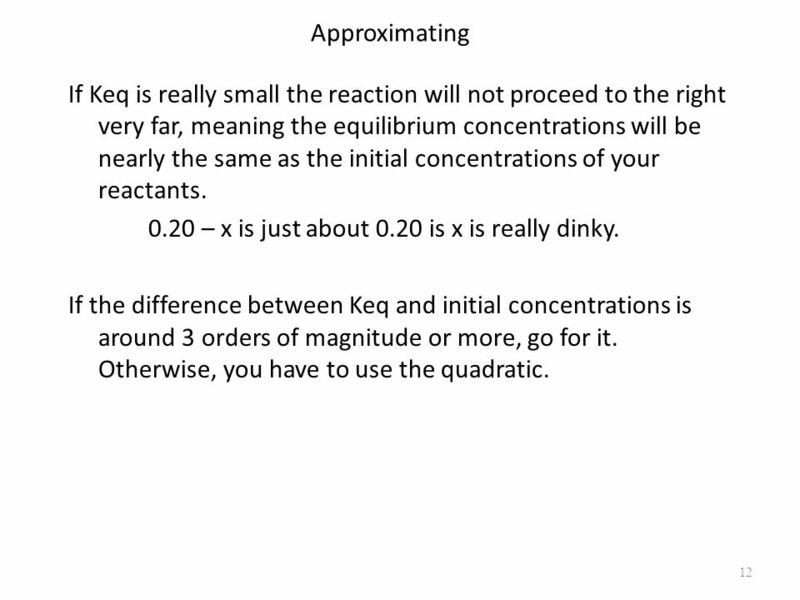 You use Keq to find the concentration of a reversible reaction at equilibrium. You use Q to find the concentration of a reversible. Reaction Reversibility. Sample problem (similar to 11 & 12) 2 1 N 2 O 4 (0.20) NO 2 (1.60) N 2 O 4 : first find start and finish, then draw curve Start. Equilibrium. 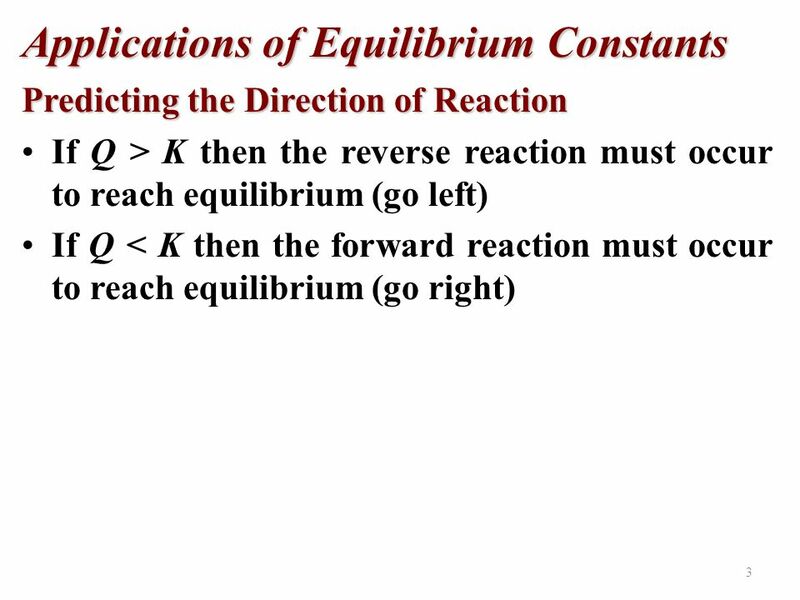 Equilibrium Some reactions (theoretically all) are reversible reactions, in which the products take part in a separate reaction to reform. There are essentially two types of problems which can be analyzed by ICE tables. Type 1 A. The initial or equilibrium concentration of some substances. 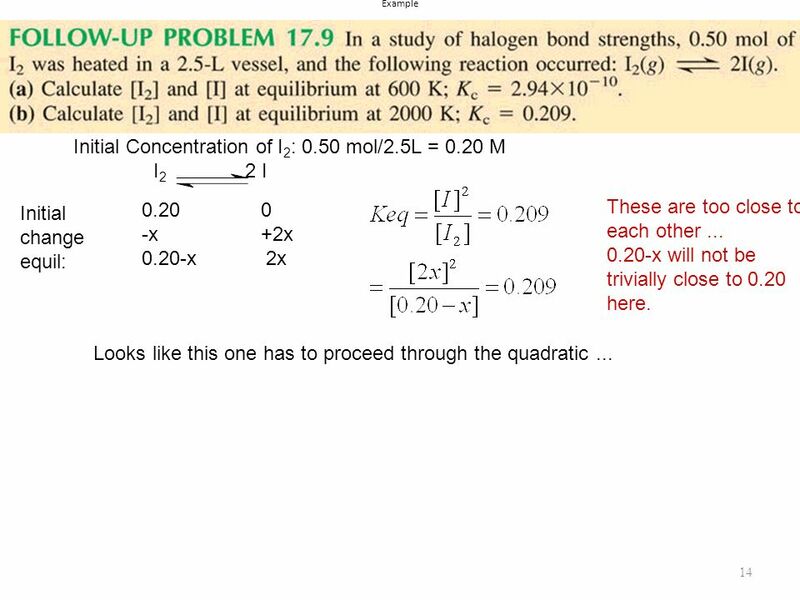 K c and Equilibrium Problems (4 types). 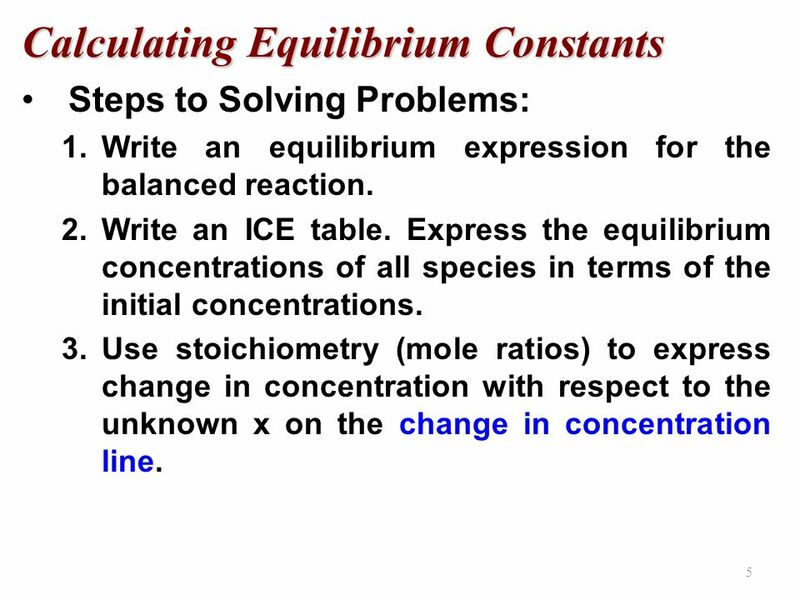 Additional KEY Terms ICE table Solve 4 types of problems involving equilibrium constants. Reaction Quotient-Q- Or Trial K. The Keq is a constant- a number that does not change Increasing the Temperature of an endothermic equilibrium shifts. 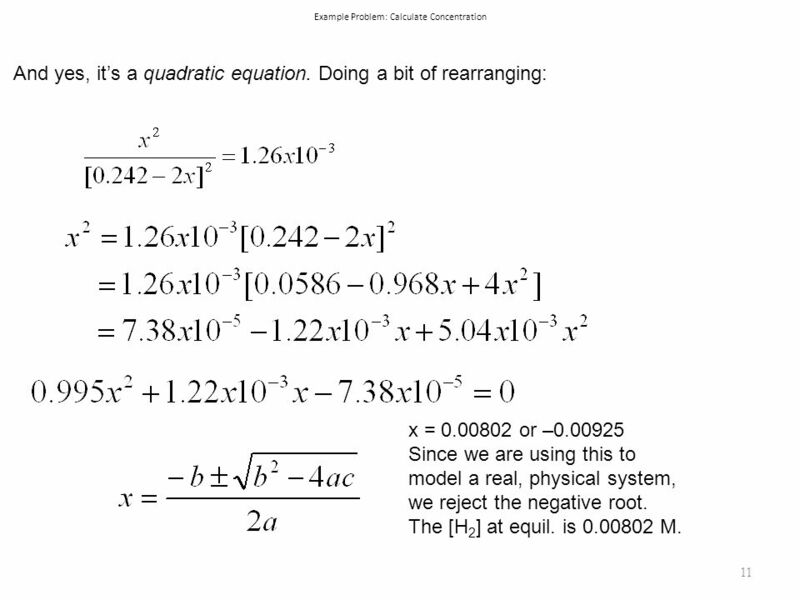 Review of Equilibrium AND Calculation of Equilibrium Concentrations. Reversible Reactions Reactions can be reversed depending on energy flow. For example if the battery in a car is dead, you can jump start it. Chemical Equilibrium Chapter Equilibrium Equilibrium is a state in which there are no observable changes as time goes by. Chemical equilibrium. A.P. 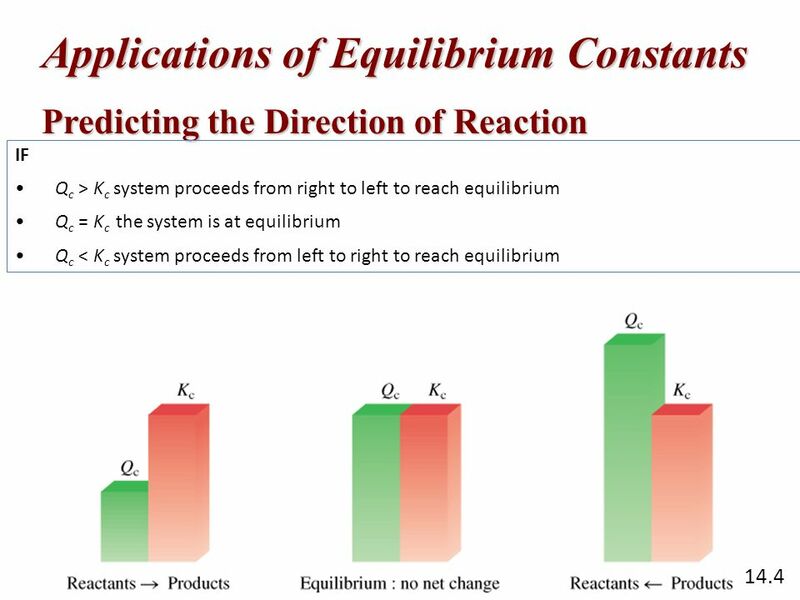 Chemistry Chapter 13 Equilibrium Equilibrium is not static, but is a highly dynamic state. At the macro level everything appears to have stopped. Equilibrium UNIT 12. Overview  Concept of Equilibrium  Equilibrium constant  Equilibrium expression  Heterogeneous vs homogeneous equilibrium  Solving. Chemical Equilibrium – Part 2b GD: Chpt 7 (7.2, 17.2); CHANG: Chpt 14 Copyright © The McGraw-Hill Companies, Inc. Permission required for reproduction. The ICE table is as follows: H 2 I 2 HI 601. The ICE table is as follows: H 2 I 2 HI 602. 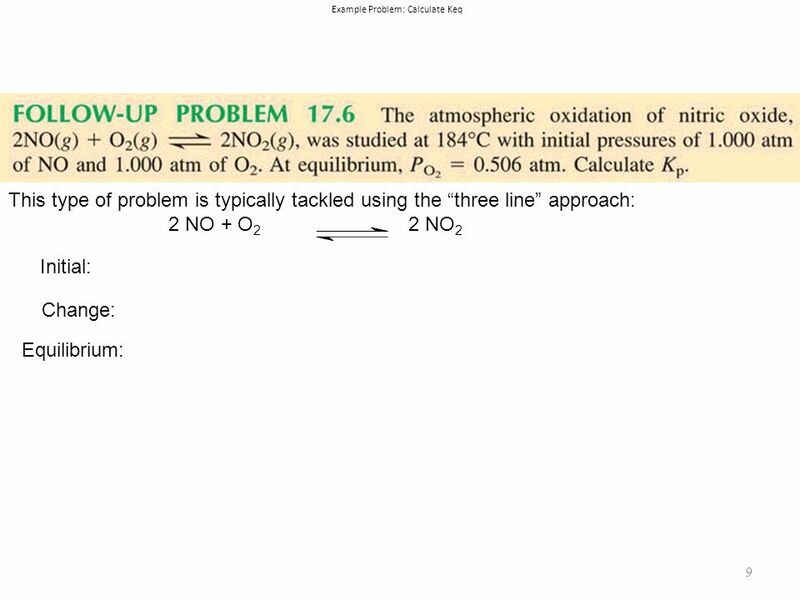 Equilibrium Entry Task: Jan 8 th Tuesday At 1100 K, K p = 0.25 atm  1 for the reaction: 2 SO 2 (g) + O 2 (g) ↔ 2 SO 3 (g) What is the value of Kc at this. Chapter 13 Equilibrium. 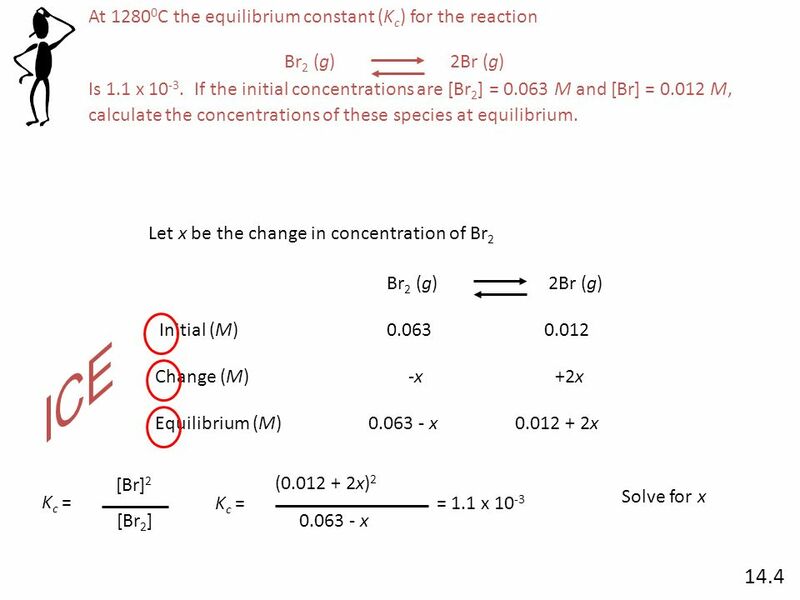 Unit Essential Question Z How do equilibrium reactions compare to other reactions?